A book that puts you back in the driver’s seat. Kindergarten admissions … two of the scariest words in a Manhattan parent’s vocabulary. Between writing personal essays and going on a dozen (or more) school tours, the application process can be as stressful and time-consuming as a full-time job. But of all the hurdles a parent has to jump through in pursuit of one acceptance letter, it’s the intelligence testing (in New York, that’s primarily the ERB for private schools, the OLSAT for public-school gifted-and-talented programs and the Stanford-Binet for Hunter College Elementary) many find the most anxiety inducing. Enter Karen Quinn, a kindergarten admissions counselor turned novelist. Her first book, The Ivy Chronicles, charted the fictional travails of a tod- dler tutor and became a national best seller. Soon after its debut, Warner Brothers snapped up therights for a motion picture adaptation, now slated to star Sarah Jessica Parker. But Quinn still didn’t feel satisfied, so she set about penning a how-to guide for parents looking to help their children improve their IQ scores. “I owed it to people to put this information out there,” says Quinn, who originally fell into tutoring after helping her own then 3-year old son lift his IQ scores from the 37th to the 94th percentile. “In New York, it has become so competitive,” says Quinn. “A good score may not be able to get your child into school, but a bad score can keep your child out.” For yers now parents either had to turn to tutors, which cost $100 to $200 per one- hour session, or buy commercial test prep materials that sell for hundreds of dollars; with her new book, Testing For Kindergarten, Quinn hopes to level the playing field—her book is priced at $14.99—and put the power of preparation back in the hands of the parent. “You can so easily help your children. And it’s organic. You’re child isn’t crashing for a test; they’re learning not only what they need for testing, but also what they need to do well in school,” she says. Testing for Kindergarten breaks down test prep into seven specific abilities—language, memory, mathematics, knowledge, visual-spatial, cognitive and fine motor skills—and includes 125 fun activities to help children get ready for the big day. (My son loves doing these.) There’s also plenty of insider tips and common-sense advice to put even the most nervous parent at ease. As a companion for the book, Quinn developed a Web site that offers free daily test prep questions, and created a board game—think of it as an IQ-boosting Candyland—for up to four children, available via www.testingforkindergarten.com. Play dates may never be the same again. To read this review on BlogCritics site, CLICK HERE. Kindergarten has already begun for some children, but for others preparation is just beginning. Some parents prepare their children a few months in advance, others a year, and still others a couple of years, depending on where you live. Testing for Kindergarten; Simple Strategies to Help your Child Ace the Tests for: Public School Placement, Private School Admissions, Gifted Program Qualification, by Karen Quinn is a must have for parents of pre-schoolers. Karen Quinn knows first hand the struggles of preparing her children for schools and getting into the tough and sometimes “throw-down” competitive New York Schools, so she’s a pretty amazing source if you ask me. I’m just glad she wrote a book with all of these tips and tricks on school. The book contains chapters like, “The 7 Abilities of Highly Successful Kindergarteners,” and “Sneak Learning into the Moments you Already Spend with your Child.” My favorite segments since I have a three year old is chapter five, “What is on the Test?” This chapter has a number of different exercises showing what types of problems will be on the entrance exams. I really enjoyed testing Miss A and seeing what she knew and what she didn’t. The Appendix also has another set of exercises, so this book is chocked full of ideas to encourage your child’s development. There’s also a great section on what each age should know at ages three, four and five, so again you can use the checklist to be sure that your child in on track for their age, or jump with delight if they’re a little advanced. Among the pages of tips on admission, there are exercises and mini lesson plans to encourage your child’s growth in fine motor skills, cognitive skills, spatial reasoning, mathematics and so much more. I could read and re-read this book because there’s always something new to learn. No school preparation book would be complete without a listing of recommended reading materials. In Testing for Kindergarten, Karen Quinn gives so many great book suggestions in different categories including picture books, starting off small. Whether you’re looking into private, public, magnet, or special-education schools, Testing for Kindergarten is chocked full of valuable information. I would recommend this for any parent with a child or children about to enter school. By the age of 5, almost every child in America will have been given some sort of IQ test. Whether your child is going to a private kindergarten or a public school, he or she will most likely be tested—and placed in classrooms according to those results. But information about intelligence tests is closely guarded, and it can be difficult to understand what your kids need to know. As an expert who has successfully taught hundreds of parents how to work with their own children, Karen Quinn has written the ultimate guide to preparing your child for kindergarten testing. The activities she suggests are not about “teaching to the test.” They are about having fun while teaching to the underlying abilities every test assesses. From the “right” way to have a conversation to natural ways to bring out your child’s inner math geek, Quinn shares the techniques that every parent can do with their kids to give them the best chance to succeed in school and beyond. It’s just good parenting—and better test scores are icing on the cake. In addition, to giving parents the inside scoop about testing that teachers and educators know but fail to tell parents, Quinn provides the reader with many actives you can do with your kid to enhance their learning momentum. Some of these activities can also be found at her website(http://testingforkindergarten.com). The part of this book that really stood out to me was, “You are your child’s most important teacher.” As parents, aunts, uncles, and friends we know that children tend to mimic everything they see and hear from us. I know I just love when my great-niece takes her book from me and starts to read it to me. She even changes the pitch of her voice to dramatize what I do. Oh and she is only 1-year-old. But she learned this from us reading to her and now she mimics us. Cute. I say all that to reiterate, parents we are our children’s first teachers. As a certified parent educator with Parents As Teacher, I love going into homes to assist families in making sure their children are on the right path. I recommend this book to any and all parents. It teaches you invaluable information that you can use and pass along. I know I will be buying a copy for each of my nieces to make sure they understand these concepts while teaching my great-nieces. Note- When speaking of parents I often refer to “our” children or “our” roles as parents. I am not a mommy yet, but I feel an obligation to do my part to help educate all children. I feel that as humans we are in this together and it is “our” role to educate. It really does take a village to raise a child. Regardless of whether they attend public or private school, most children will be given some sort of IQ test by the age of five. Author Karen Quinn has written a compre- hensive guide to this secret world in Testing for Kindergarten (Fireside, $14.99, 272 pages, ISBN 9781416591078). It’s a process foreign to most parents, and these early test scores don’t even correlate well to later success. However, the tests have enormous impact on whether a child will get into a competitive private kindergarten or a free public gifted program. Quinn turned herself into an expert on the topic after her son Sam was faced with developmental delays caused by hearing problems. At age three, he scored in the 37th percentile. After Quinn’s intervention, he scored in the 94th. Testing for Kindergarten shows how every parent can improve their child’s abilities and scores. First, Quinn explains the most common IQ tests and the seven abilities they measure. Then she helps parents refocus the way they interact with their child to start sneaking learning into everyday life. Daily Life Lessons are easy ideas, like what to do while setting the table, and there are loads of games and activities. Quinn keeps the overload factor down by focusing on the most important things you can start on day one (dialogic reading, talking to your child constantly). Don’t miss this empowering guide. It’s interesting because here in Columbia, SC, in the city public school system, my 5-year old was not tested prior to entering kindergarten. However, there is a K4 program for which children must be tested in order to enter it, and from what I’ve been told from other parents, you must “fail” the test in order to get in. I guess this prepares children who are behind in specif areas for kindergarten. But since testing for Coco won’t be until August sometime, I don’t have any first-hand experience to impart. I like the fact that the book is NOT geared toward “teaching to the test”. That is one of my pet peeves. It was when I was in school, and it is now that I’m in the working world and have trained other people, have been trained by others, etc, I believe it serves no purpose to teach people only enough to pass a test. We need to teach concepts as well, so that people can get an understanding of what they’re learning, instead of simply teaching them how to memorize a specific thing that ends up never translating to the job well. This is a parent-friendly book. Karen Quinn describes the different types of IQ tests, what they test for, and how they test. She explains the types of test questions. If you sign up on her website, she will also email you sample test questions for you to review with your child. My 4-year old was excited to review the “puzzle” questions I had for her. They take hardly any time. And I could hear her talking to her big sister (age 6) and big cousin (age 10) in the other room and explaining what she knew. It was cute. She describes other ways to incorporate the skills a kindergartner should have before kindergarten. It makes it really easy to learn. Obviously, this isn’t a book to read in one setting, and then put it back on the shelf. This is the type of book you’ll skim the first few times, then sit down and read word-for-word, over the course of several months, as you help to prepare your little one for school. This is definitely a keeper. Kindergarten has already begun for some children, but for others preparation is just beginning. Some parents prepare their children a few months in advance, others a year, and still others a couple of years, depending on where you live. 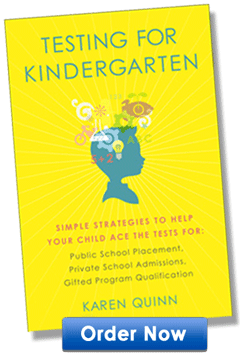 Testing for Kindergarten; Simple Strategies to Help your Child Ace the Tests for: Public School Placement, Private School Admissions, Gifted Program Qualification, by Karen Quinn is a must have for parents of pre-schoolers. This book not only sheds light on the abilities and skills tested for admission to or placement in kindergarten, but offers hundreds of suggestions for low or no cost activities to entertain and teach your child. Most of the activities require little more than an active imagination. We have already tried a few of the recommended games and my preschooler gave them a thumbs-up. Even my older child wanted to get in on the games. The book also suggests fun educational products and games that you can buy separately that also help teach skills needed for early school success and readiness. I would recommend this book not only to parents, but to babysitters, daycare providers and early education teachers. This is a good read even if you have no intention of having your child sit for any of the standardized tests required for admission to private or selective public kindergarten. Well worth the price! As a mom of a young preschooler in Los Angeles, where the competition for the best public programs is fierce, I had been feeling helpless and intimidated about how to navigate the system and make sure my son gets the best opportunities. Then this book crossed my radar. I found it pitch-perfect in terms of demystifying the process, giving me plenty of very specific info in a conversational, easy-to-absorb format. I also applaud the humor and sense of balance – we all think our kids are special and daydream about what they’ll achieve someday, but we don’t want to push them too hard and rob them of the joys of just being a kid. I found it really reassuring that I’m already doing plenty right – and empowering to know what I can be doing in the months ahead to keep the ball rolling.